Dealing with an unfamiliar currency is one of the unique daily challenges faced by travelers. First, you'll have to figure out the best ways to get local currency without making too many middlemen rich(er). When paying, you'll have to do the exchange rate in your head, then fumble to find the right denominations in your wallet, perhaps while impatient people tap their toes in the queue behind you. Fortunately, working with the currency in Malaysia is easier than in India, Myanmar(Burma), and other places with somewhat confusing money that looks the same. One of the first things travelers notice about Malaysian money is how colorful it is. The colors and varying sizes aren't just art: they serve a useful purpose. You'll quickly learn which colors match which denominations and know amounts with a glance. Compared to U.S. dollars which are uniform in color and size, Malaysian banknotes are colorful, creative, and implement advanced anti-counterfeiting measures. Unlike the U.S. dollar, visually impaired people can judge amounts based on the size of the denominations. The word ringgit actually means "jagged" in Malay. It refers to the Spanish silver dollar coins with rough edges that were once used in Malaysia during colonial times. Prior to 1975, the currency in Kuala Lumpur was the Malaysian dollar. Very rarely, perhaps as a throwback to the dollar days, prices can sometimes be seen listed with "$" or "M$." The ringgit was pegged to the U.S. dollar until 2005 when Malaysia followed China's lead by removing the relationship between the two currencies. The Malaysian ringgit is not traded internationally. Malaysian ringgit is available in denominations of RM1, RM5, RM10, RM20, RM50, and RM100. In the 1990s, the government demonetized the RM500 and RM1000 denominations to curb money laundering — don't allow someone to give you one! This typically isn't a problem, but a fair amount of these notes are reportedly still out there. Each denomination of the ringgit is a unique color to make identification easier. Amounts are printed in large type and are easy to read. Malaysian ringgit implements several high-tech features to make copying and counterfeiting difficult. Like in Singapore, currency is printed on higher quality paper than money found in Thailand, Indonesia, and neighboring countries. 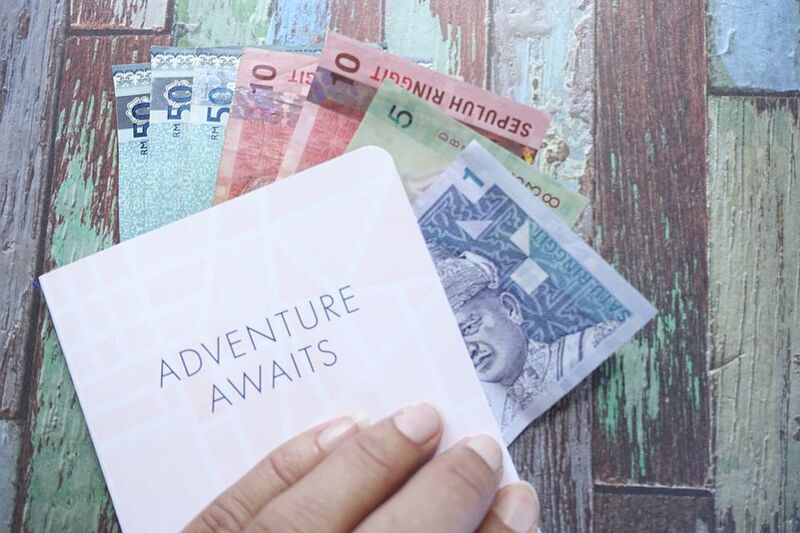 Although RM60 and RM 600 ringgit banknotes were printed in December 2017 to commemorate the 60th anniversary of the signing of the Federation of Malaya Independence Agreement, you as a traveler will probably never see one. These special banknotes were grabbed up by collectors and are valued at higher than face value. Malaysian ringgit is further divided into 100 sen (cents) with coins in denominations of 1, 5, 10, 20, and 50 sen. Some of the coins are so lightweight that they seem fake! The surprisingly small 1-sen coins are less common. Unlike in Thailand where coins tend to accumulate quickly, tourists slowly end up encountering many coins in Malaysia beyond a few 50-sen coins. Prices are often deliberately rounded to the nearest ringgit. In some instances, supermarkets don't want to deal with low-value coins, so you'll actually get a few candies back instead as part of your change! Since 2000, one U.S. dollar has been roughly equivalent to between 3 – 4.50 ringgit (RM3 – RM4.50). As usual, you will encounter currency-exchange kiosks at the airports in Kuala Lumpur as well as in malls and touristy places. Although exchanging money is sometimes the best option, ATMs typically offer a better rate, assuming your bank doesn't punish you too much for international transactions. You'll be less subject to scams perpetrated by humans if you stick to using ATMs. Compare the current exchange rate to the ringgit "sell" rate posted by the kiosk. Count your money in plain sight of the attendant before walking away from the window. Globally networked ATMs can be found throughout Kuala Lumpur. Fees to withdraw money, if any, are notably lower than Thailand's brutal 220-baht fee (around US $7 per transaction). Tip: Using ATMs that are physically inside or attached to bank branches is always the safest practice. You stand a better chance of recovering your card if it is captured, and there is less chance that a card-skimming device is installed on the machine. These hidden devices capture and store your account number as the card is put into the machine. Using an ATM standing in the shadows away from the main strip is generally a bad idea for many reasons. RM100 banknotes given by some ATMs are less convenient to break on the street. Many vendors won't have change on hand. To avoid a hassle for both of you, try to find ATMs that issue cash in denominations of RM50, or enter an amount that requires the machine to dispense smaller denominations. Some ATMs indicate (either by signs or on the screen) the maximum size for dispensed currency. One way to start out with some smaller banknotes is to deliberately request amounts that ensure you'll get small denominations. For example, request RM450 rather than RM500 — at least you'll receive one RM50 banknote instead of just five RM100s. If the machine allows multiples of 10, RM490 would be even better to request. Tip: Let your bank know that you'll be traveling, otherwise they may deactivate your card for potential fraud. If that happens, you may not have easy access to funds! While you're at it, find out about any international transaction fees that will be deducted for using ATMs while abroad. As in other countries in Southeast Asia, small change can sometimes be hard to find for local businesses. They may have to fight through not having enough change for the rest of the shift if you clean them out early. Paying for your RM5 street noodles with a RM50 banknote is just bad form — try not to do it! Mindfully accumulate and horde small change to pay street vendors and people who have trouble breaking large banknotes. It's a currency game that everyone in Southeast Asia plays every day. Save those big RM50 and RM100 banknotes to break when paying at hotels, bars, chain mini-marts, or other establishments with plenty of cash flow. Don't stick the "little guys" with them. Although usage is generally in decline, American Express traveler's checks are the most readily accepted as a form of emergency backup currency. You will pay a fee per check to cash at banks, so bring larger denominations (e.g., one $100 check is better than two $50 checks). Record the serial numbers of any traveler's checks you're carrying. You'll be able to get replacements if the ones you have are damaged (i.e., get wet) or stolen. One quick way is to snap a photo of the front and back of each check, then upload the photos somewhere private. Visa and MasterCard are the two most commonly accepted credit cards in Kuala Lumpur. Large hotels, nice/chain restaurants, malls, dive shops, and other businesses will accept credit cards, but they may tack on a service fee or commission. Smaller merchants and eateries may not have a way to accept cards. Overall, it's better to forgo the rewards points and just use cash while traveling in Malaysia. Tipping is not customary in Malaysia, however, tips may be expected in luxury hotels and at five-star establishments. A service charge of 10 percent may be added to hotel or restaurant bills in nicer places. Go ahead and round up fares for taxi drivers, assuming they used the meter and didn't quote you an inflated price as often happens in Kuala Lumpur. They'll probably tell you they don't have any change anyway!